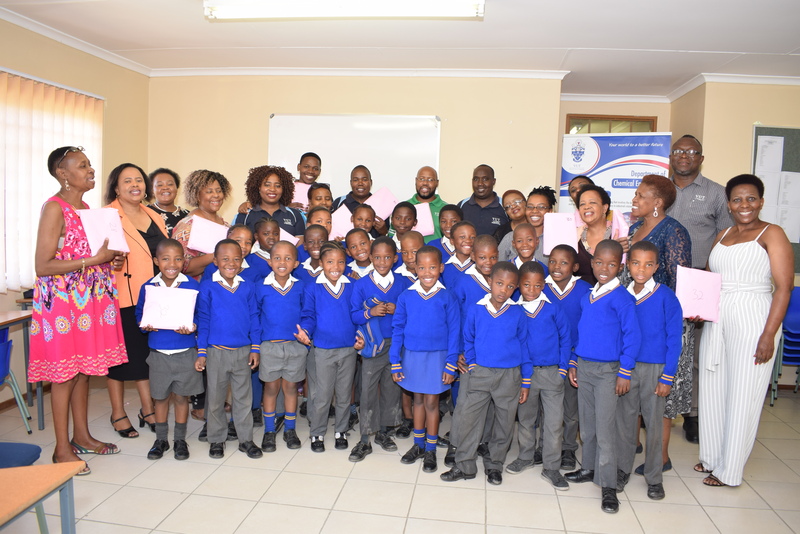 On 30 October, VUT lecturers from the Chemical Engineering Department donated 42 jerseys to the Emfuleni Primary School in Bophelong. Sarah Tumisi, a teacher from Emfuleni Primary School, happened to meet the head of the Social and Outreach Committee in the Chemical Engineering Department, Mrs Letsabisa Lerotholi, while at the Vaal Mall where she was asking for donations from the shops there. Ms Tumisi told Mrs Lerotholi that there were twins at the school where she works who had to share a jersey in winter. This touched Mrs Lerotholi who in turn brought the matter before her colleagues, and they were more than willing to lend a hand. “It takes a nation to raise a child,” said Ms Tumisi. She added that “you must never stop caring and sharing”. The Deputy Principal of the Emfuleni Primary School, Ms M. Khomo, said she would like to thank God for allowing the two ladies to meet. She also said that the principal was very happy that VUT staff came bearing gifts. 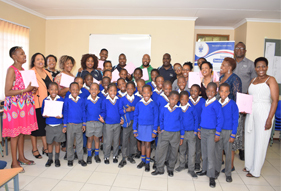 She was accompanied by her staff, including the Heads of Department of the Foundational Phase at the school, Mrs M. Makhalemele and Mrs M. M. Monyane. The teachers and learners also thanked the VUT staff for the gifts. Lecturers and staff from the Chemical Engineering Department together with the Metallurgical Engineering Department bought the jerseys out of their own pockets, and on the day were represented by the following staff members; Nhlanhla Nyembe, Shonisani Muthubi, Gadinkosi Dube, Edward Modiba, Letsabisa Lerotholi, Professor Hilary Rutto and Professor Peter Osifo. The Head of Department, Professor Osifo said he appreciates the contribution his colleagues are making to the community. He also thanked the teachers for being there for the learners. Mrs Lerotholi was further prompted to ask teachers to motivate their learners to reach for the stars: “We can all be professors in life, should we so wish” she said. She explained that there is a dearth of black professors, so young children have few people to look up to and learn from in this regard. Emfuleni Primary is a quintile 1, full-service school. Many of the students are from child-headed families. Any help from the community would be greatly appreciated and would go a long way in helping the learners.